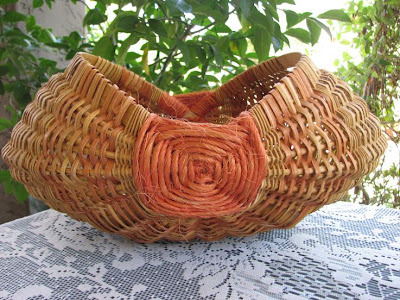 We recently “sat down” with Char from Someplace in Time to discuss the craft of basket weaving, the changes the craft has seen in recent years, and what inspires her. How long have you been weaving baskets? I’ve been weaving handmade baskets for about 16 years now and have enjoyed every minute of the adventure. What got you started weaving? My husband was stationed in Germany in the early 1990's when I first began taking lessons. 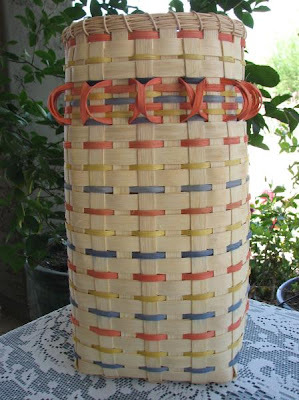 There were two pilot wives that both wove very different styles of baskets, and they taught me to weave. Both had been weaving and selling professionally for many years. I was very fortunate to have come across them at a time in my life when I was open to such wonderful craft. Do you follow a particular school or weave in a particular style? Do you belong to any national or international societies for weavers? One of the methods of weaving I use is by following a printed basket pattern. Instructions are complete from the length and quantity of reed to cut, to the steps to follow from start to finish. My favorite way to weave is to make my own border, insert ribs, and let the design take me where it wants to go. This way, no two baskets are ever the same. You never know what you’ll end up with! It's a surprise with a certain amount of control on the part of the weaver. I belong to a group of weavers from all over the United States that holds weaving conventions in various locations once a year. What changes have you seen in the craft over the past decade or so? I don't think the weaving world has changed much with time; that's to say, the techniques are probably pretty much the same. The methods and the materials don't really change, but the craft itself, I think, has taken a nose dive. 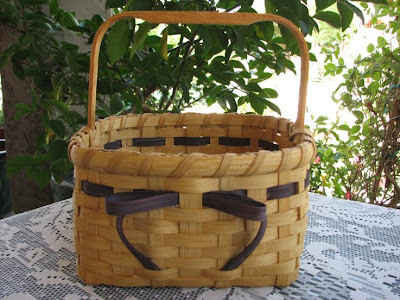 If you look back in time, everyone used baskets in everyday life, from gathering food and laundry to drinking water and ale. There were even suitcases made out of reed, and adorable baskets for your bikes. In many cities in the United States, you can still find weavers doing and sharing their craft with the public, and many selling at craft shows and doing demos in museums, etc. I think, like many crafters, that we’ve seen the arts change with the influx of inexpensive imports. It's a shame really when it becomes hard to find something handmade with love in the U.S.A. I would rather pay a little more and have something special that can be handed down to future generations, than to pay a little for something that won't last and will end up being thrown in the trash. Mass produced means nothing to me other than hundreds of other people owning the same exact thing. Describe the weaving "community." Are basket weavers a close-knit community? Are they open to sharing their skills with other weavers? Or do some hold their "secrets" close? In my opinion, this craft is better seen--more popular if you will--in the south and on the east coast. Maybe that's because there are more craft fairs in those locations where the art of weaving is more appreciated. Because I am now residing in the Southwest, Indian weaving is highly sought after, so that is competition I am not interested in pursuing. I think sharing one’s knowledge of this craft is the same as any other. Some will and some won't give away trade secrets. I usually share all my knowledge with anyone who will listen! I do believe that what goes around comes around, so if I can help a fellow crafter better herself, I will. I’ve never taught weaving, although I have been asked many times. I don't feel I have the patience for teaching, and that is the sole reason I haven't ventured into that side of the craft. What other crafts do you do? What crafting tool can you not live without? I grew up crafting and have tried just about everything you can think of. 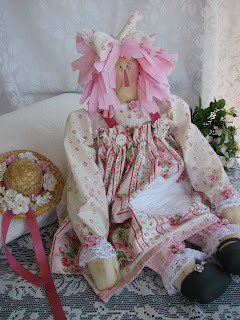 I used to smock for our daughter, who is now grown. I’ve done ceramics, knitting, crocheting, tole painting, stained glass (I still do glass), pottery, and the list goes on and on. I’ve been sewing forever, and it’s my number one craft at the moment. The one crafting item I could never be without is a pair of scissors, and when I weave, I have to stand up! Weaving comes in spurts. When our grand-daughter was born, I wove an Easter basket for her as well as one for our son and daughter. 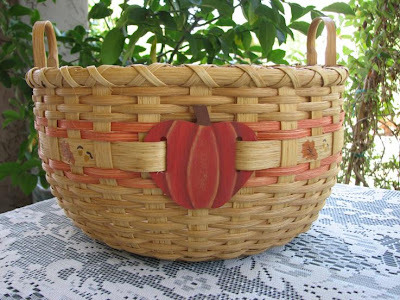 I weave baskets for our neighbors at Christmas and fill them with homemade cookies and candies. That’s how I keep my fingers in the craft! I’ve been told by other weavers that baskets are “coming back into style.” It's funny, because I really never thought they went out. I think there isn't a room that can't be made better looking with a basket of some sort sitting around somewhere doing a job of holding towels, magazines, napkins, plants, remotes, toys and on and on and on. 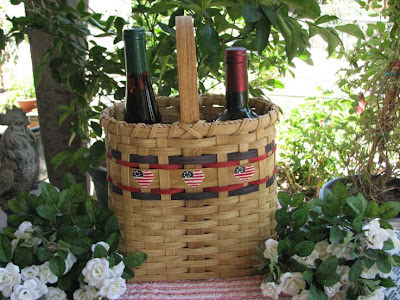 There is no greater hostess gift in my opinion than showing up with a bottle of wine in a great basket, or a basket filled with beautiful napkins and candles. You just left a keepsake with a friend. 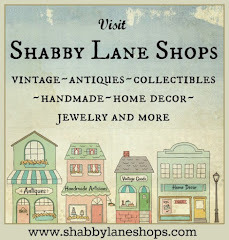 Be sure to visit Char's Etsy shop Someplace in Time and her blog, Someplace in Thyme. I recently completed a special custom order for a lady who is a hug bluebird fan. I decided on this jewelry box to pair some colorful, blooming Hydrangeas with a bluebird perched on top. I had the flowers spill over to the front and sides of the box just a bit as I like to carry the design around to all the sides as much as possible. I also like putting a special surprise on the inside of each of my jewelry box lids. It is nice to have something to look at when you open the box as well. I found this wonderful piece of hand counted cross stitch at a tag sale quite some time ago and have finally found the most wonderful fabrics to design a beautiful pillow for the shabby cottage style! I used vintage laces to surround the cross stitch as well as gorgeous long soft white lace end ruffles. This pillow would be wonderful as a porch pillow too. I can just picture it on a white wicker settee! 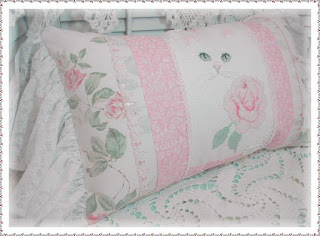 Mention that you saw this pillow in the Etsy Cottage Blog and get 25% off! We recently “sat down” with Karin from Icing on the Cake Studio and Creative Chaos to ask her a few questions about cakes, crafting, and inspiration. How long have you been “baking” these cakes? What was your original inspiration for your first cake? Actually, not that long. I was getting ready to do my one-year blogiversary giveaway and was trying to think of something that would be fun and relevant to the “big” event. Somehow, someway, a Birthday Cake popped into my head and away I went with it…. What are your favorite materials to use? How long does it take to make one? I start with papier-mâché boxes. 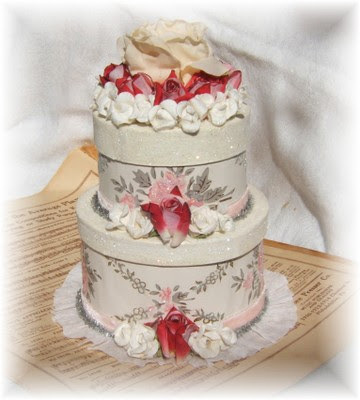 I love to use vintage wallpaper as the base of the cake but have been known to use whatever strikes my fancy at the time. 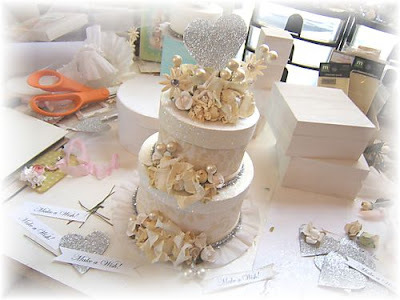 From there, I use trims, ribbons and papers to “frost” the cake and embellish it with flowers. I always finish it off with a ton of glitter. The time it takes to make one can vary depending on the complexity of the design and how much my kids are bugging me while I’m working on it. 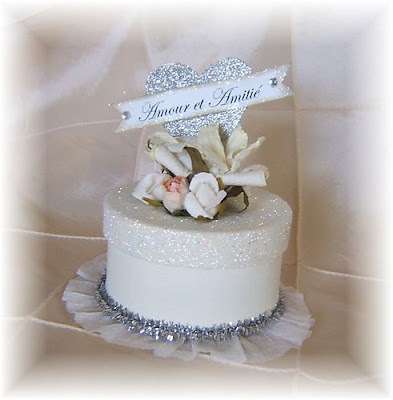 Do people usually buy your cakes for décor or for a special occasion? Usually both. The nice thing about a cake is that I can personalize it for the occasion or for the person. What was the first craft you learned to do? At what age? What are your favorite crafts to do now? What inspires your crafting now? I feel like I’ve been crafting as long as I can remember. Creating and art are a part of me as much as my arms or legs. It’s something I always felt drawn to. Although I began college as an art major, I eventually changed to Journalism and Psychology. I fell into the field of social work for a number of years before starting my own design business about 10 years ago, and I designed and sold children’s layette and embellished picture frames wholesale through sales reps until my first son was 3. I then decided to put it aside for awhile to stay home with him and my second son. Just about two years ago I was itching to get my creative groove back, I started creating jewelry, and then I discovered the world of creative blogs and was hooked. I took a completely different direction with vintage paper collage and paper art … not to mention the fun I was having writing in my blog. The whole blog community has inspired me beyond words. With young children, I felt a bit isolated artistically, so blogging has been a great way to connect with other artists who “get” my need to create. That really has been the biggest inspiration for me lately. What music do you listen to while creating? When I have my way, I listen to an odd mix of 70’s music and old-school rap on my cable station. When I don’t have my way, it’s usually a mix of Thomas the Train songs. Not the most inspiring music to work to … but it keeps certain little people happy! What is the craft tool you can’t live without? Does coffee count? No? Well then my glue gun. I LOVE my glue gun! I’ll let you in on a little secret if you promise not to tell my husband: I leave it plugged in all the time. Yep. Because you never know when you’re going to have a glue emergency and there just isn’t time to wait for the darn thing to warm up! I also love Paper Glaze for affixing my glitter—it changed my life and the way I glittered forever. What do you find is the biggest obstacle to leading a creative life? Never enough hours in the day to create!! What idea/motto/etc. do you use to get you through those rather "uncreative" moments? It sounds soooo cliché … but, “this will pass.” I used to get freaked out when I wasn’t feeling the “creative groove.” I would think that last great idea flew out of my head and that was the end of that. But what I’ve discovered is that everything comes in waves, and creativity is no different. When I’m feeling less than inspired, I totally go with it. I now know that subconsciously I’m just recharging my batteries, and I have the confidence to know that inspiration will return. Is crafting your "main" job? If not, what do you do in "real" life? What is your hope for the future of Icing on the Cake Studio? Right now being a mom to two active, fun boys is my “main” job. Everything I do for Icing on the Cake and Creative Chaos works around them right now. But as they get older, and especially when my youngest goes to school, I’ll have more time to carve out. I love being with them and know they’ll be growing up faster than I can imagine. So, right now it’s a balancing act between the two things I love to do: being a mom and being an artist! 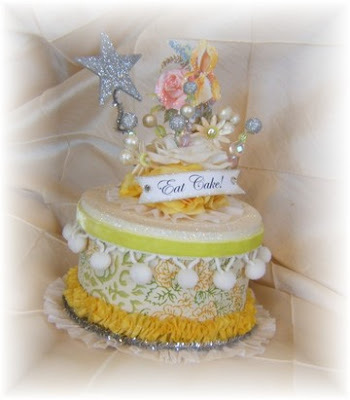 Be sure to visit Karin’s Etsy shop Icing on the Cake Studio and her blog Creative Chaos. Right now I'm offering a flat rate special on most of my signs. All of my larger signs ship for only $10.00 (within the continental US) . Add a second sign for only $5.00 shipping. If I see that you are close to me and shipping is less I will refund the difference. Shipping for Canada is $15.oo for the first sign. I posted this on my blog on the ning site but wanted to mention it here as well. I'm de-stashing my Marie Antoinette rubber stamps which I purchased from Character Constructions a few months ago -- and have never used. I was in a Marie Antoinette "phase" at the time and thought these stamps would be lovely to have. Turns out, my "phase" is over and I know I won't use these, lovely as they are. If anyone is interested in purchasing, please email me at ning. I paid just over $15 for each set but I'm selling each set for $10 or $18 for the pair. I will pay the postage. I left them with the ink on so that they would show up better in the photographs, but they will be cleaned before being passed on -- only used once to test them out!